We've been hearing promises and seeing demos of flexible displays for a while now. So long that it seems as though the tech may never arrive, but a new report is saying that we could actually see flexible displays as soon as next year, and that Samsung could be leading the pack, at least that's what the BBC is saying. Samsung is obviously not the only company working on the technology. LG, Philips, Sharp, Sony and Nokia are all working on flexible displays, but the word is that Samsung will be the first to actually ship the displays in products, and it could happen next year. According to the report, LG has already begun mass producing flexible e-ink displays, but Samsung could be the first to make a flexible smartphone display, likely using Samsung's favorite OLED tech. Of course, we still don't have flexible motherboards, or flexible batteries, so don't expect fully flexible phones just yet. But, flexible displays would definitely end that whole problem that we saw with the iPhone 4/4S, and that the Nexus 4 is having with cracked glass. Flexible displays are said to be virtually unbreakable. But what about the phone's body then? When you don't have to worry about transparency there are plenty of materials that can protect the phone better than aluminosilicate glass. May i just say that this is real innovation...not perfect but its a start and Sammy is really brining it! Agree, it may have other application that we yet to find out. But I think as of now flexible screen is not the best solution for phones. Well, we said big screens and less buttons are not practical for mobiles. Look where we are now. Given enough support, flexible screens can be the next big thing on mobiles and tabs. I think these flexible displays paired with Cornings upcoming willow glass would be a good combination. No one says that this display from beginning will be for a phones, there is more devices in a world than only a phones. Using OLED technology make flexible display relatively isn't so hard, better news would be if they could improve organic compounds. The article clearly states "we still don't have flexible motherboards, or flexible batteries, so don't expect fully flexible phones just yet." as for the body/casing of phones there are plenty of materials on the market which could be used to make a flexible body. The big plus here is finally having a display, which we won't have to worry about getting cracked, when our lovely devices get dropped. We all know what a pain this can be. That would be disgusting. Sorry to say that bro. Why would you want a flexible phone? who said you have to use a flexible screen for a phone? Maybe someone can use it to make single sheet flexible e-reader someday. The article says SS will make the flexible screen for phones. First of all the article don't say that Samsung will make flexible display for a phone. Where do you see that? Primary source is Samsung not author of the article and Samsung did not made any official statements that first device with a flexible display will be a phone. 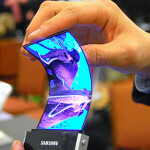 "but Samsung could be the first to make a flexible smartphone display" Here it is. I see, you are right. This is only rumor so of course noting is confirmed just yet. Let's be serious, is a flexible phone more useful or a flexible sheet reader more useful? I serious doubt people will pay good money so that they can have a bendable to show off. Companies will be better off spending their R & D on bendable paper instead. Last time I checked paper was already bendable. LOL Having this technology could change mobile tech as we know it man. The possibilities are truly endless! Sounds like something Steve Jobs would ask. Why do you need a flash for a camera phone? Why do you need a larger display on a phone? Why do you need a tablet smaller than 9.7"? The answer to all of these questions is, because, with the exception of iPhone owners, consumers typically know what they want, more than an arrogant CEO. Well some CEO's like to shove crap down our throats too. Don't even know that the phone does need to be flexible. Biggest draw of this type of display would be as Michael said-more durable, scratch and impact resistance. But, a phone with a flexible body/keyboard would be more durable as well..
Holy crap it is a micheal h article. I didn't realize since the words "cupertino" "apple" and "iphone/pad/pod" were not heavily inserted.